How to fix Error code: 116171? Home »	Uninstall » How to fix Error code: 116171? Issue: How to fix Error code: 116171? Hi guys. Could you, please, tell me if there something wrong with the pop-up message „Error code: 116171.“ I have started receiving it a couple of days ago. It says that my personal and financial information might be at risk and provides a telephone number that I should call for in order to save the information. What should I do? I‘m afraid someone‘s trying to deceive me. Anyway, please help me to fix Error code: 116171 pop-up. Thanks in advance! Dear user, thank you for your question! It seems that “Error code: 116171“ is a newly released malicious pop-up message, what means that calling for a provided number would not solve anything. Contrary, you may get into serious trouble! 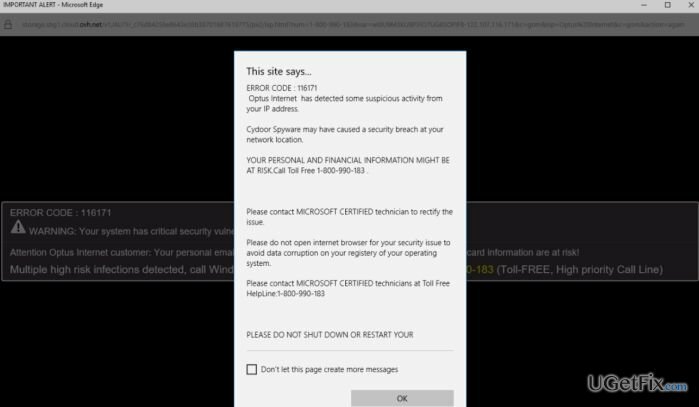 If you have started receiving “Error code: 116171“ pop-up while browsing the Internet, it means that Internet Explorer, Mozilla Firefox, Google Chrome, Safari or any other web browser that you prefer using has been infected with an adware. As you may probably already know, adware is an ad-supported web browser extension, which is used for either displaying third-party ads or even trying to involve into online scams like this. Oputs Internet has detected some suspicious activity from your IP address. Cydoor Spyware may have caused a security breach at your network location. Your personal and financial information might be at risk. Call Toll Free 1-800-990-183. Please do not shut down or restart your browser. First of all, don‘t panic and don‘t even try to call the given number. All you have to do to fix Error code: 116171 is to delete the adware that is responsible for displaying the pop-up. If you have dealt with an adware program before, you may already know how they may be rooted out of the system. To make it clear, we are going to introduce the methods that can be applied for Error code: 116171 removal. How to remove Error code: 116171? First of all, open Task Manager. For this purpose, you can either right-click on the task bar and click on the Start Task Manager button or press Ctrl + Alt + Delete at once. Your task here is to end web browser‘s process. Therefore, find Google Chrome, Mozilla Firefox, Google Chrome or another web browser that you are using, click on it and select End Task. When you open your web browser the next time, don‘t allow to open the windows from the previous browsing sessions. Click Start (bottom left corner) → Control Panel → Programs and Features if you are using Windows 7 or Vista. If using Windows XP, click Start → Control Panel → Add/Remove Programs. Open Quick Access Menu by right-clicking in the lower-left corner of the screen. Then open Control Panel and select Uninstall a Program for Windows 8/10. Once you perform all these steps, a quite long list of programs should be disclosed to you. Here you should go through each of them and try to find the ones that you are not familiar with and that you certainly don‘t remember installing. Make sure that you uninstall each of them. For that, click on the program‘s name and select Change/Uninstall → OK.
To find the shortcut on Mozilla Firefox, Internet Explorer, Google Chrome and other browsers installed on your machine, right click on it and open Properties. Find Shortcut tab and select Target Field. Find URL that looks not suitable, click on it, select Delete and then OK. It is very important to check whether this dubious adware hasn‘t replaced your default start page or search engine. For that, open Mozilla Firefox again, go to Options and select General. If your homepage is Google, Bing, Yahoo or another that you have set by yourself, everything is OK. However, if you see that the default settings were changed without your permission, make sure that you reset the settings by clicking Restore to Default or by entering your preferred Homepage URL. To reset your browser, open Firefox menu, go to Troubleshooting Information and then click Reset Firefox. Open IE browser, click on the Gear icon to open Menu (right top corner). Here select Manage Add-ons. On the panel of Manage Add-ons, look through all questionable browser extensions and disable them. For that, right-click each of them and then select Disable. Open menu once again and go to Internet Options. When in General tab, replace the homepage address with a URL of your choice. Then hit Apply to save. To reset IE, open its menu, go to Internet Options → Advanced. Click Reset. Remove suspicious websites by clicking X next to each of them, and then enter a URL of the site that you would like to set as your homepage. To reset Google Chrome, go to Menu → Settings, then click on Reset Browser Settings button at the bottom of the page. Open Safari, and then find and click Safari in the menu bar at the top of the screen. Then go to Preferences. While trying to reset Safari, click Safari and Reset Safari… option. When Reset Safari pop-up message appears, check all checkboxes and click Reset. As you can see, performing Error code: 116171 removal is not that easy task. In fact, it‘s a time and patience consuming procedure, which when performed manually can easily fail. If you have tried to perform all the steps indicated above, but you still receive a false pop-ups, we recommend to fix Error code: 116171 automatically with the help of Reimage. Kaip pašalinti Error code: 116171 klaidą?